How SBI turned my passion for Aruba into a Profitable web business. My name is Kimberly, and I am the writer, editor, and owner of www.Aruba-Sunsets.com. I originally created this site to share my love for the island, Aruba, and reveal some of our travel tips and experiences. I tell the story of our romantic Aruba destination wedding and how my passion for the island compelled me to create a website in order to share Aruba with you and the world. In this section, please allow me to tell you how exciting it is to actually be building my own travel website. It was easy to turn my passion for a romantic island in the Caribbean into an income earning web business with Site Build It! (SBI for short). The road to web business success was not always easy and straightforward. I always wanted to start my own business, working at home on my own time. But without a degree in business, not knowing a single thing about starting one for that matter, how was I going to do it? About 8 years ago, I was invited to start a business selling candles at home parties. It was fun for a while, and I did make some money. But, I always felt a little sleazy begging my friends and family to “do a show” and offering incentives to anyone who would offer up the names and phone numbers of their friends and family. When my close friends started avoiding me, I knew it was time to quit the candle show business. With tons of inventory leftover, I got an eBay seller account and I learned the ins and outs of online auctions. I sold most of the stock items for a profit. Easy Peasy! "It would be so easy to run my candle business if the company allowed its sales consultants to sell the products online. No sales pitches, no cold calls, no soliciting friends for leads." But, alas! They did not. The success that I had selling my candle inventory over the internet only proved to me that if I was going to succeed in a business it would be online. All the web business books agreed that to create an online business, you must first be online. So, before I found another product to sell, I needed a website. I started small and FREE. I had a Yahoo’s “Geocities” site, and a couple of Blogs, but never got any traffic. The biggest problem was I knew nothing about HTML code, or programing, and my $5,000 didn't include technical support or site design. As a matter of fact, it didn't include much of anything but anger, frustration and very uncooperative phone conversations. "How do I create an opt-in form?" "How do I set up an auto response e-mail?" "How do I submit my site to the search engines?" The answer to each on of my questions was "Yes, ma'am, we offer that feature for an additional cost." A year later, frustrated beyond imagining and completely broke, I gave up on that business. Was I doomed to spend the rest of my life in a dull grey cubicle simply because it guaranteed a paycheck? If my previous failure was any indication, it seemed I was going to be stuck in cubicle Purgatory for the next 30 years. Maybe, I was wearing rose colored glasses, but, I wasn't ready to give up completely on my dream of running my own internet business. NOT JUST YET. Our romantic trip to Aruba reignited that travel spark and the desire to be my own boss. I was reminded that there was so much more to life than traffic jammed freeways, and cramped cubicles. So, I also wanted my business to be portable. 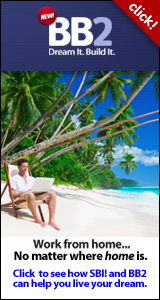 I needed an online business that allowed me to work from home, (wherever home might be.) I recently learned that there is actually a term for this... Location Independent Entrepreneur. Hmmm! The book was called The Work-at-Home Masters Course, and was a step-by-step guide showing how these women were earning good livings working for themselves from their computer, using the internet and a company called Solo Build It! These moms were the honest and sincere mentors I was seeking. That was my introduction to SBI! and a new beginning. At first I was skeptical. Who wouldn’t be after all the time, energy, and money I lost in my previous endeavors? But, my desires to be creative and independent were intrigued by SBI’s no risk guarantee, and besides Ken Envoy, (owner of Solo Build It) and his team answered all of my questions and addressed my concerns BEFORE I put down my hard earned cash. This was the beginning of my online success. I made the commitment, and purchased SBI!, and started reading the Action Guide. It took me a few weeks of researching the correct key words and the perfect URL name. Then a few more months of writing content and pages for the web, build good links, and start a e-zine and mailing list. I proudly shout "I did it all myself with the help of SBI!" Aruba-Sunsets.com continues to grow and thrive. SBI! makes online business success do-able. Anyone can succeed with an all-in-one process, the right tools, and step-by-step guidance. 6 Reasons NOT to Make Money online.